Add 1 cup boiling water to each flavor gelatin/ jelly crystals in separate bowls. Stir well for 2 minutes until completely dissolved. Pour each flavor of prepared gelatin into separate shallow food storage container sprayed with cooking spray and then refrigerate until firm. 3. Sprinkle unflavored gelatin over 1/2 cup cold water and keep it aside for 1-2 minutes. Stir in remaining 1 1/2 cup boiling water. 4. Add condensed milk and mix well. Cool slightly. 5. Cut flavored gelatin/ jelly into small cubes and randomly place cubes in a tray or pan sprayed with a cooking spray. 6. 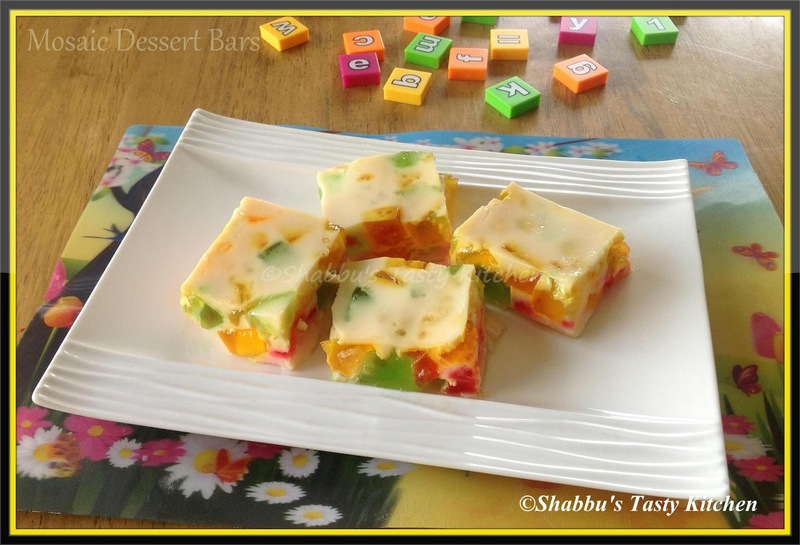 Pour condensed milk mixture over cubes; stir to evenly distribute gelatin cubes. Refrigerate until firm before cutting into bars. Colorful and inviting. Thanks for linking. Wow.. this looks fabulous.. Love this idea.. Am sure this will be a hit among the kids.. Very cute and catchy dessert bars.